Bir-Billing is located southeast of Dharamsala and Billing is situated north of Bir on the way to the Thamsar Pass leading to Badha Bhangal. Billing is located at a distance of 14 km from Bir. Bir-Billing is twin destination and incomplete without each other. Bir Billing is mainly a Buddhist town and houses a monastery and a Tibetan handicraft center. One can trek from Billing (Bir-Billing) to Raj gandha for 12 kms an easy trek (2300 mts to 2400 mts) and then from Raj Gandha to Plachak (2500 mts) and then t o road head Bada gran village. Villages in the trek are very beautiful as around Deodara, Oak and Rhododendron. Villagers are semi nomadic and mostly are shepherd, some growing vegetables. Trails are so easy and a family trail for trekking. During world cup its not possible to fly tendom, but before you can try your hands for paragliding at Bir-Billing with experienced pilot. If you are interested in soaring high in the sky and enjoy the untouched scenic locations, verdant landscapes, mountains, and more from above, Bir-Billing is the destination to visit. 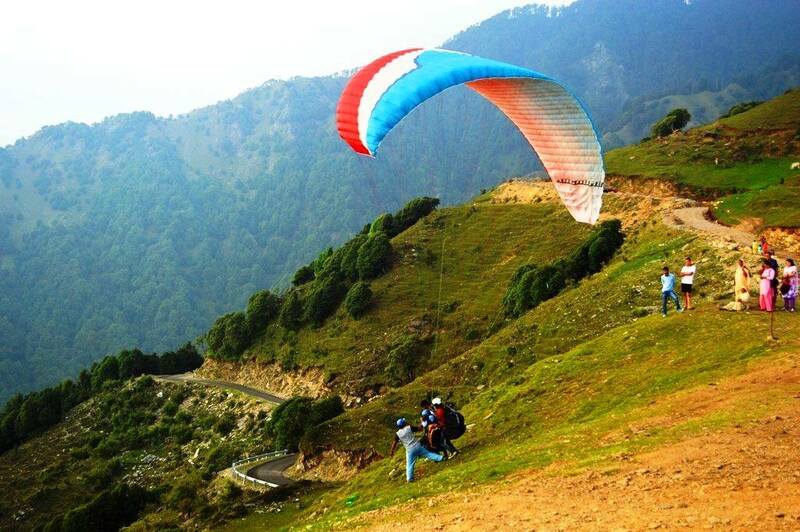 It offers excellent world-class facility for paragliding and is one of the best gliding sites in the world. Every year, a pre-World-cup paragliding event is organised at Billing. It also organised the very first Paragliding competition as per the rules of Federation Aeronautique International. You take off from a little verdant meadow at Billing (2400 m). The meadow is considered to be one of the wonders of the nature. It has been naturally designed as a launching pad, and is perfect for a good take off. The meadow is above the villages of Bir and Chaugan. Bir is the landing ground for the Para gliders who take off from Billing. It is located at a distance of around 14 km from Billing. In Billing, You can pitch your camping tent at the ridge and enjoy the spectacular and panoramic view of the Kangra Valley and Beas Valley. If you want to camp, travel bir-billing team here to organize for you. Exact Location: Bir (Bir-Billing) is located 70 km from Dharamshala, and Billing is located around 84 km from Dharamshala. Kullu Manali Airport at Bhuntar is the nearest airport from Bir-Billing and the nearest rail head is at Joginder Nagar. Reaching here, one can hire a taxi to reach Bir-Billing. Bir-Billing is well connected by road with Manali. Dharamsala and Mcleodganj: Reaching Dharamsala is another easiest option to reach Bir-Billing. One can also reach Bir Billing by road from Dharamsala. Dharamsala is well connected by road. There are easy road transport facilities available from various destinations of India including Delhi, Chandigarh, Shimla and Pathankot to reach Dharamsala. The road network to Dharamsala is well-maintained and is connected by National Highway 1 (NH1). The nearest railway station to Dharamsala is Kangra Mandir (narrow gauge) which is at a distance of 22 km. It is a small station and hence all of the trains do not stop at this station. The major rail junction is Pathankot, which is about 85 km away from Dharamsala. Pathakot is well connected to all the major cities in India. The nearest airport to Dharamsala is the Gaggal airport in Kangra valley. The airport is at a distance of 12 km from Dharamsala and reaching here, one can hire a taxi to reach Dharamsala. Dharamsala: This is a highly captivating town in the upper reaches of Kangra Valley. The town is divided into two three parts”the upper Dharamsala called Mcleodganj, the middle Kotwali Bazar and the lower Kaccheri area. Dharamshala is bounded by dense pine and deodar forests, tea gardens and beautiful hills. The place plays host to the Tibetans population and Tibetan government in exile. Dharamsala is also the starting point to a number of trekking trails that lead trekkers across Dhauladhar into the upper Ravi Valley and Chamba district. Palyul Choekhorling Monastery: Palyul Choekhorling Monastery, also known as Nyingmapa Buddhist Monastery was established in 1980 by the highly revered Rigo Tulku Rinpoche. It is one of the largest monasteries in India and is home to around 107 monks from different places such as Bhutan, Nepal, Ladakh and Tibet. Baijnath: Baijnath is a picturesque town and a famous pilgrimage destination for the followers of Hindu religion. The main attraction here is the ancient Baidyanath Temple which is dedicated to Lord Shiva. One can also visit Tashijong Gompa, located at a distance of 5 km and worth a visit. Bajinath is located 46 km south east of Dharamsala. The temple is on the way to Bir Billing. Hotels are only available at Bir and book your camping from Bir to organize it at Billing.